Another week! Wow. And it was a busy one and yet a completely lazy one all at the same time. But lazy is good sometimes, yes? #1 - Daddy/Daughter dances are important. If you are a bride, you might not think it's a big deal. But when Daddy is no longer around, the pictures and the sentimental moment are well worth the extra 5 or so minutes. One of the best songs? I've been experimenting. My word, this stuff is YUMMY! #3 - Commitment is a beautiful thing. #4 - There isn't anyone I would rather work side-by-side with than Jonathan. We understand each other and we work well together. From the parenting (stemming from that commitment thing) to the picture taking - there isn't anyone I would rather do anything with. #5 - A lot of people think that the wedding is the biggest celebration that you could possibly have in your lifetime - therefore they spend lots and lots of money on "the big day." I don't think that's a bad thing at all. Weddings SHOULD be celebrated - in grand style. But I really don't think we ought to stop there. A wedding is the first day of a couple's commitment to one another. Then they start in on their lifetime - the for-better-or-for-worse thing. I love collecting ideas for "every day" parties. Attention to detail, yummy food, good music, a community of close and loving friends - those are things that can be attended to and celebrated with many times over. Babies? New jobs? An open window following a closed door? God gives us many opportunities in which we can celebrate LIFE! I think we should take advantage of them and put pretty flowers on the table more frequently than we typically do. I could probably write a longer list of things I've realized, thought about or gleaned from this past wedding season but I'll stop there and wish you all a happy, fun-filled weekend! In my circles people don't dance at weddings, but I've always thought the father-daughter dance was sweet. I wonder why they don't have mother-son dances? I love Father of the Bride. I had never heard that song before, but it fits so well. I've heard of orzo but have never explored what one does with it. Amen about commitment, and I feel the same about preferring to do things with my husband rather than anyone else. I've been thinking about the small things too...what can I do to make someone else's day more enjoyable? 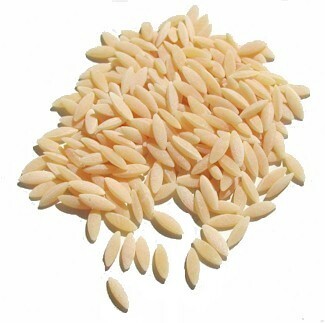 I've used orzo in soup, but not in any other recipes. It's fun, isn't it? I've also thought about how we sometimes tend to focus on the wedding rather than the marriage. In a way, it's like anticipating a baby. (It's funny that, when I was expecting, I never thought about how the baby would grow into a toddler, a child, a teen, an adult. Very weird.) I agree about finding things to celebrate all through life! Yes, commitment is a beautiful thing. I didn't completely "get" that until after I was married. Yes daddy/daughter dance is important. I lost my father recently and your post reminded me of my dance with my father. You are so right about commitment. It's beautiful and it requires work and intention for it to be a success. I so agree with you on celebrating life! Father of the Bride is one of my fave movies ... now that you reminded me of it, I might watch it this weekend. Commitment is a beautiful thing and it is a choice. May we all choose to remain faithful to our commitments. I've never had orzo, now I'm curious. How wonderful that you have such a sweet spirit about photographing weddings. My niece has done a few weddings and I've learned from her that it is a LOT of work. It's also great that you and Jonathan can do it together. I love your idea of celebrating more of the everyday things in our lives too. All worthwhile! Have a great weekend. It wasn't til very recently that I realized that you were associated with the blog that I used to love that always shared the wedding photos. LOVE THAT! You guys are such talented photographers. Wish you lived close to me - I'd love to have you do my kids! I love weddings and agree that they should be celebrated. Its so wonderful to share that day with a couple. I love orzo too. I don't use it much, but I always like it when I do. I can not wait for my daughters to dance with their father. Precious. Thanks for the list, it was great. I love your everyday party idea -- it's so true, we need to celebrate the everyday! Do you and your hubby work together on the photos? A couple of times a year, my husband and I work together on a production, and we just love it. Hope the week ahead is a great one! Not having a dance and not giving my Dad a daddy/daughter dance is one of the biggest regrets of my wedding day. I still get sad about it 27 years later. Love the Father of the Bride movie! And I love Orzo! So much you can do with it. Yummy. I can remember years ago that we had large dances at weddings and yes the father-daughter dance and then the new husband cut in and it was considered the their first dance. I remember my father daughter dance like it was yesterday, thanks for reminding me of my dad. Orzo pasta, hum my son cooked it up with Italian sausage, tomato, herbs one time it was yummy. It must be awesome to be a wedding photographer! I loved this post!